Posted on March 24, 2009 March 29, 2010 by Pavel Y. This cocktail with german name and interesting composition was found on one of my new cocktails book – Falken mixbuch: 1444 Rezepte mit und ohne Alkohol by Peter Bohrmann. Shake with a lot of ice and strain into cocktail glass. Garnish with a maraschino cherry. 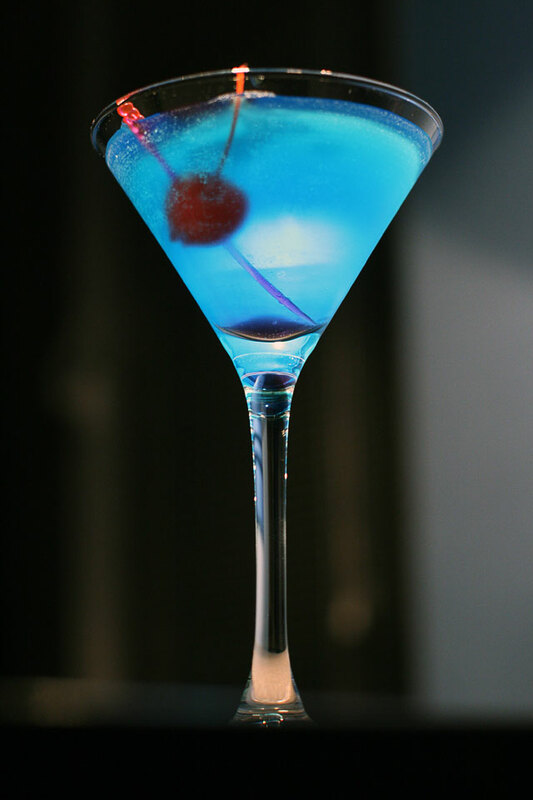 The Russische Nacht Cocktail has flickering deep blue color and looks great :) The taste is very interesting smooth orange-anise taste with bitter-sweet aftertaste. I think it is admirable cocktail. Я никак не могу понять: ты коктейли подсвечиваешь что ли или это вспышка так непонятно (для меня) работает? Коктейли я, конечно, подсвечиваю :) Вспышкой для съемки коктейлей я не пользуюсь, вся подсветка – это просто игра со световым оборудованием, которое висит у меня над барной стойкой и вообще в репрезентативной зоне квартиры. I’m not generally a fan of blue drinks, but that thing looks gorgeous. This gives me a opportunity to finally make some use of my sample bottle of Uluvka which has rested on my shelf since january. I dont mind blue drinks!